A reader asked me for a guide to praying for her future husband. Answering her question proved a little harder than I first thought it would. Maybe it's because I didn't start praying specific prayers for a husband until after I met Steve. Or maybe it's because I realize that though most people eventually do marry, not everyone who wants to marry will. Still, we're called to pray—about everything. 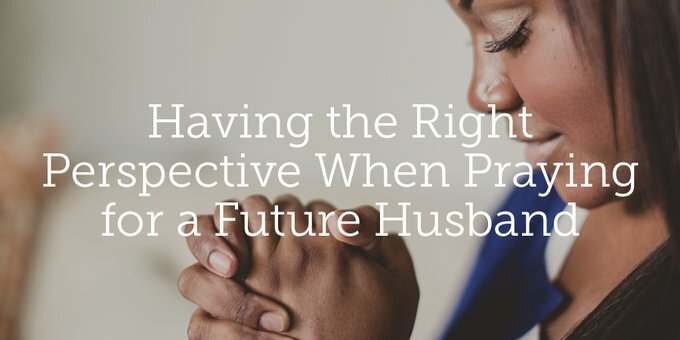 So what should prayer for a husband look like? My mom used to encourage me with Matthew 6:33 when I'd call (at least once a week) to complain about still being single. She always took me back to that verse: "But seek first the kingdom of God and his righteousness, and all these things will be added to you." She even encouraged me to give thanks for the difficult circumstances. "Give thanks for not having anyone ask me out?" I'd say, with not just a little anger and emotion. "Yes," she'd say gently, but firmly. "Thank God for this opportunity to praise Him, to grow in your faith, to grow in your dependence on Him. Give thanks for the things you most want Him to change." Do not be anxious about anything, but in everything by prayer and supplication with thanksgiving let your requests be made known to God. And the peace of God, which surpasses all understanding, will guard your hearts and your minds in Christ Jesus" (Phil. 4:6–7). We're supposed to ask for a husband humbly (that's what supplication means—asking for something humbly) and with thanksgiving. I know how hard it can be to give thanks in the midst of doubt, fear, broken relationships, disappointment, and more. How can you feel thankful when you're hurt, angry, and frustrated? Thankfully, we don't have to feel it. The verse just says give thanks. When I'm anxious (and most need this verse! ), saying "thank you" always starts as an act of the will. And often I have to pray for the grace to do that! But obedience has the benefit of producing good fruit. "Seek first His kingdom," she would say. And I'd cry, and we'd pray, and the more I did that, the more I submitted my unmet longings to God. My pain led me to pray, and giving thanks protected me from bitterness. Spending time talking with God created the opportunity for Him to soften my heart, shaping my desires to conform to His. My heart needed to soften, primarily because my pride was keeping me from being like Him. I don't know what changes God wants to make in you. We're all different. But there is great work to be done. None of us are perfect. We all stumble in many ways (James 3:2), and we all have areas where we need to be more like Him. If you daily submit to His process, even in the pain, He will change you. What if God answers your prayers differently than you want Him to? He is able to transform the desires of your heart to align with His and to satisfy you completely. We may never be able to understand this with our finite minds, but the Holy Spirit makes it possible to grasp it in our spirits, so that we may pray with Jesus, "Thy will be done." Read the Gospels and you'll discover a passionate, feeling man. Thank God we have a Savior who is in touch with the real world, who prays that he will not drink the cup of his Father's wrath, who cries out on a rough wooden cross, 'My God, my God, why have you forsaken me' (Matt. 27:46). Jesus neither suppresses his feelings nor lets them master him. He is real" (p. 123). It was only after Jesus prayed, "If you are willing, remove this cup from me," that He prayed, "not my will, but yours be done." The whole point of prayer is to grow in relationship with God. The more we talk and listen, the more God shapes the conversation. As we grow closer to Him, our desires shift from what we want—what we think we most need—to what He wants. His desires become our desires. [God's] gift of grace involves the gift of a new heart. New desires. New longings. For the first time, we want God. We see our need for him, and we love him. We seek after him, and we find him, and we discover that he is indeed the great reward for our salvation. . . . [W]e are saved to know God. So we yearn for him" (p. 39). Some 70 to 80 percent of high school seniors say marriage is extremely important. And 80 to 90 percent of Americans eventually marry. But what if some of the people who don't marry really wanted to? How do we reconcile what's statistically probable with what's supernaturally possible? I talked about this before in my post "Plenty of Men to Go Around." Never-married women are a lot like Peter walking on the water. Peter wasn't supposed to be able to walk on water. And when he made that fact his focus, along with the storm and treacherous waves around him, he did what you'd expect. He sank. But when he fixed his eyes on Christ, he did the unexpected. For many women, getting married would seem just as miraculous. Praise God that He hasn't changed—He's still the same wonder-working God who walked with Peter on the water. He still does the unexpected. But we have to do our part. We have to keep our eyes on Him. In the process, He may change our attitudes, our expectations, our habits, our health—whatever needs changing. He can do anything—He's God. You can trust Him and count on Him. He is faithful. Faithful, but not predictable. Things may not turn out how you want. In C.S. Lewis' The Lion, The Witch, and The Wardrobe, Susan asked Mr. Beaver about Aslan saying, "Is he—quite safe?" Mr. Beaver replied, "Safe? Who said anything about safe? Course he isn't safe. But he's good. He's the King, I tell you." You can know that wherever your journey with Him leads, it will be good. O Nebuchadnezzar, we have no need to answer you in this matter. If this be so, our God whom we serve is able to deliver us from the burning fiery furnace, and he will deliver us out of your hand, O king. But if not, be it known to you, O king, that we will not serve your gods or worship the golden image that you have set up" (Dan. 3:16–18). The God we serve is able to bring you a husband. But even if He does not, will you continue to trust Him and His goodness? Before You Pray for a Husband . . . When I first started writing this article, I was thinking in terms of a list of traits to ask for and specific verses to pray. But the more I wrote and prayed, the more I realized that God's leading in our prayer life is individualized. Each of us is unique, and His work in us differs from person to person. That's not to say you can't pray for a godly husband who meets the requirements of the "husband verses. "1 I think you should. But I also think you should ask God to show you how to pray given your story and this particular moment in history. This morning I was praying about this article and wondering how God might lead me to pray if I were still single. I realized that before I could pray for a husband, I'd need to pray that this generation of men would be transformed by God's power to rise up as men capable of the commitments of marriage. Given all the bad news about men, it occurred to me that even before we arrive at praying for men as suitors, we need to pray for men as our brothers in Christ. Many of them are spiritually limping. I believe we should be asking God to raise up a generation of godly men who are not only willing to take on the challenge and calling of being godly husbands and fathers, but who are also able to do so. Whatever season of life you're in, you need to pray, because prayer is about relationship with God. Whether single and praying about your desire for a husband; or later, if you're married, praying about your desire for a baby; or praying for your (or your husband's) need for a job; or if you never do marry praying about serving faithfully while celibate, the need to pray never ends. Jesus told His disciples they "always ought to pray and not lose heart." It's never too soon, or too late, to start. How does this article encourage you in praying for your heart's desires—whether for a husband or something else? In what unique ways can you pray, according to "your story"? 1The "marriage verses" are the passages that lay out the job description husbands and wives are called to. They include Ephesians 5:22-28, Colossians 3:18-19 and 1 Peter 3:1-7. They're the standard for what makes a good mate. As you read them, you'll realize men aren't the only ones who need prayer. Don't just pray for your future husband, pray for yourself—the future wife. A big part of marriage prep for women is praying through the "wife verses," especially Proverbs 31 and Titus 2. This post is adapted from Candace's article, published on Boundless.org. Used with permission. Did you discover God’s Truth today? Our team loves sharing quality posts to help you serve Christ to the fullest in your calling. If you have been helped or encouraged by this writer today, would you consider giving a few dollars to support the True Woman blog? Candice Watters is a wife, mom, writer and speaker. She and her husband, Steve, created Boundless for Focus on the Family in 1998. In addition to her bi-weekly advice column, she is the assistant editor of the Family channel for CBMW.org. She is the author of Get Married: What Women Can Do to Help It Happen and co-author with Steve of Start Your Family: Inspiration for Having Babies. Next Post Why Does My Husband Get to Be the Leader? Should I Pray for a Husband? Get daily encouragement and teaching on biblical womanhood sent directly to you each day.